1) My Southern, Hippie, Married, mom of four life! 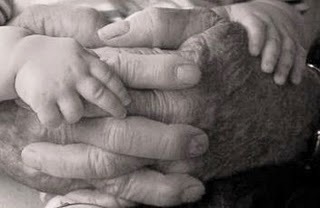 this photo is beautiful, the aged hands with the very young hands...the choice of black & white, one of the comments was that this would make a beautiful painting- I agree. "all of life is seeing the extraordinary in these everyday moments."